Translation review is the vital part of localization. The first step of each review process is to find suggestions that haven’t been reviewed yet. Since this fundamental task can be quite tedious in Pontoon, we’re making it better! You can easily filter the so called Suggested strings, which have at least one suggestion, but none of them have been approved yet. Those are definitely suggestions you should review. But there might be others, which are harder to find. If a string has an approved translation and a few suggestions, when a new suggestion comes, it’s almost impossible to discover it. You can use the Has Suggestions filter, which lists all strings with at least one suggestion, but you will not be able to distinguish the new suggestion from the already reviewed ones. To overcome this drawback, you can delete all suggestions that you decide not to approve and then the Has Suggestions filter will only show strings with unreviewed suggestions. But deleting translations in not a good practice if we want to keep translation history and user statistics accurate. Today, we’re removing the ability to delete translations and adding the ability to reject them. 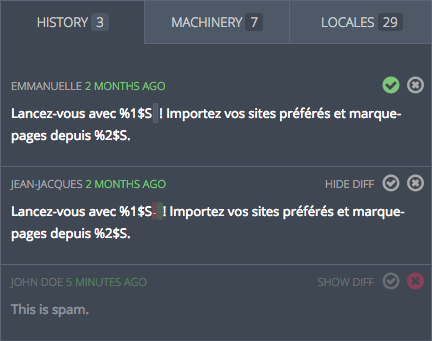 A translation can be rejected explicitly with a click on the reject icon or as part of a mass action. When a suggestion is approved or an approved translation is submitted, all remaining suggestions automatically become rejected. The three review states: approved, unreviewed, rejected. That means we’re effectively splitting translations into 3 groups – approved, unreviewed and rejected, which allows us to introduce the Unreviewed Suggestions filter. This filter finally makes it easy to list all suggestions needing a review. Important note: To make the filter usable out of the box, all existing suggestions have been automatically rejected if an approved translation was available and approved after the suggestion has been submitted. Without this change, many locales would end up with thousands of unreviewed suggestions. The final step in making unreviewed suggestions truly discoverable is to show them in dashboards. We’ll fix that as part of bug 1377969. Also, we’ll be updating the documentation soon to reflect these changes. A huge shout-out to Adrian Gaudebert who contributed the patch. Adrian joined the Pontoon team in July and is a long time web developer at Mozilla. He helped with Elmo in the past and most recently worked on Mozilla Crash Reports. We can’t wait to see what inventions he comes up with next!